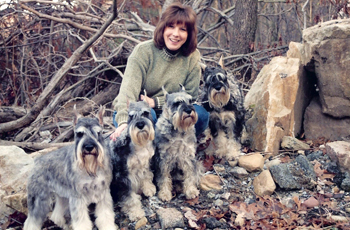 The breeding program at Centara Standard Schnauzers began in the middle 1970s and continues today. Centara has produced 80 champions and our stud dogs have increased the number of champions for many other standard schnauzer kennels. Centara Standard Schnauzers live in Central Pennsylvania where they are free to romp and play in the fresh country air. Obedience champions, Agility Champions, Conformation Champions, Therapy dogs, Canine Good Citizens, Herding dogs and… Cancer Sniffing Dog, STORMY. Centara puppies are home raised and encounter a variety of situations before going off to their new homes. All puppies are temperament tested and matched to the life styles of the new owners. Health at Centara is a priority and we work closely with an experienced veterinarian hospital to ensure the latest in health care. You can find an article written about the Centara Kennel in Popular Dogs Series, (published by Dog Fancy magazine). If you are interested in reading about mini schnauzers, standard schnauzers ,or giant schnauzers, purchase this magazine for some valuable information. You will also find Centara standard schnauzers in “Standard Schnauzer Champions” published by Camino Books – look under Working dog. 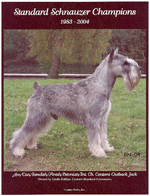 In 2010, Centara Standard Schnauzers qualified as an AKC Breeder of Merit. Click here to read about the program.